We have another very exciting interview for you today. 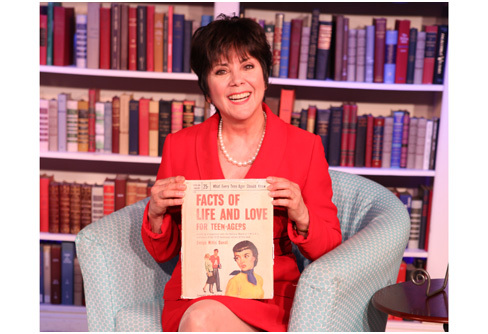 We have an extensive interview with classic TV star Joyce DeWitt (Janet from Three's Company) about her brilliant career and with roles ranging of course from Three's Company to her new off-Broadway play Miss Abigail's Guide to Dating, Mating & Marriage. I went to see the play last Saturday and got to meet Joyce and both her and the play were great (I'll give my thoughts on the play tomorrow, so come on back for that!)! We get answers to various questions that you will all want to know about, including how she got her start in theater, the gift of being an actor, details on her new off-Broadway play, a possible Three's Company off-Broadway play and if how she would do Dancing with the Stars if they asked! As always with all of our interviews, it is in Seven Questions form. 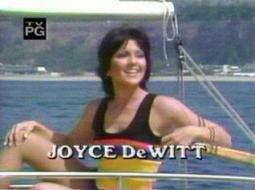 So let's first tell you a little bit about Joyce DeWitt (as if you didn't know!). Joyce DeWitt is most widely known to generations of audiences for her starring role as Janet Wood in the ABC Television hit series Three's Company, which ran from 1977-84. She also has an extensive background in the theater, working both as actress and director in a stage career which spans over forty years. Miss DeWitt has starred in numerous theatrical productions including most recently the Canadian premieres of the 2000 Pulitzer Prize-winning play Dinner With Friends and Alfred Uhry's Tony Award-winning play The Last Night of Ballyhoo. Other recent stage performances include the North American premiere of the Australian comedy Daylight Savings, the British farce Noises Off, the revival of Cole Porter's Anything Goes, and the Broadway musical Olympus on My Mind, for which she completed the cast recording - her first record album. She now stars in the hilarious new off-Broadway play Miss Abigail's Guide to Dating, Mating & Marriage. Her television credits include singing and dancing in numerous specials having had the pleasure of appearing with such wonderful talents as Greer Garson, Ann Miller, Perry Como, Bill Cosby, Anne Murray, Tony Randall, Rich Little, Cheryl Ladd, John Ritter, and Steve Martin. She has also made numerous guest-starring appearances on popular television programs including Baretta, The Love Boat, The Osmonds, Hope Island, Cybill, Twitch City, and Living Single, as well as starring in the television movies With This Ring and Spring Fling! "Seven Questions with Joyce DeWitt"
SitcomsOnline: This is truly an honor to meet you and I even get to interview you on our first meeting. This is a dream come true, as Three's Company is my favorite show of all-time! I just finished interviewing Richard Kline earlier this week, so I'm on cloud nine right now. Anyway, you were cast in the second pilot of Three's Company and the rest of course is TV history. What were some of your most memorable experiences on the show (on or off camera)? And is there a storyline you would have liked to do that wasn't done? Joyce DeWitt: You know honey, every time we did the show, you know there are always complications in life and people have their personal issues and whatever, but every time we did that show, curtain up, light the lights, audience in, here we go, and it was never anything but pure ecstasy. And so the most memorable moments would be every time we did that show for a live audience. Because we were playing as hard as we could possibly could to share joy and silliness and fun with the audience and we were lucky most of the time that played out. So my most memorable moments probably were every single time we did the show. We had great writing, marvelous staff, an incredible crew, we were so lucky, you know that whole process of having a "hit show" has not just to do with the actors playing these characters but everyone works all week to put together an episode, week after week and we had an extraordinary crew at CBS Television City, even though we were an ABC show, and we had amazing writers, fabulous producers, great costumers. We were just blessed being surrounded by an extraordinary support system and they were all professionals who were doing their jobs as well as we were trying to do ours and it ended up being a good thing, it ended up people had a good time with us. John used to say, we were not trying to make somebody laugh, we're trying to make someone laugh so hard they fall off their couch laughing. And we were willing (laughs) to do anything silly and ridiculous in an attempt to get that to happen (laughs). In terms of storylines with the show, I think we would have enjoyed going to the (Janet's) flower shop more often. I think it would have been fun to go to Larry's used car lot where Richard Kline could show his lairs. I loved that we got to go to the hospital where Terri worked several times. I think those stories involving the character's individual personal lives we could have explored more and that would have been fun, but I have no complaints about what we did because what we did was such fun and we had such a good time doing it. SitcomsOnline: We all miss John Ritter so much. I still regret to this day not ever meeting him and regret not getting a chance to see him on Broadway in 2000. Everyone knows John was very nice and a very funny man. Can you tell us something about John that we don't know about from your days working with him on Three's Company or even after the series ended? I wish you got to work with him on his last show 8 Simple Rules, as it would have been fun to see you reunited with him! Joyce DeWitt: I suppose that, I mean we all know that he was so creative and so funny, and truly Pavan, there were days you'd go home from work at the end of the rehearsal day and your face would hurt from laughing because John would just break you up constantly and so we all know what a great talent he was. And how much his heart was to create joy and also thanks to Sling Blade and other films we got to see his talent ranged the full gamut and I'm grateful that we had the opportunity for that to be known before he went up to heaven. He was a great brother; he was a really caring, committed and dedicated dad, and maybe people don't know that about him. He had, like everyone has, a serious side and a playful side. John was someone that really, really cared about everyone feeling comfortable and feeling safe in the environment and so whenever we would do huge fundraisers or whatever, he would spend most of his energy making sure everyone was feeling comfortable, and OK, and having a good time, that was so much a part of who he was as a human being not just who he was as a performer. But he was truly a good guy and a really, really good heart. Yes, he and I were in conversations about my doing a guest spot on 8 Simple Rules and in fact they had sent me a script and they had wanted us to play Janet and Jack and do this episode, and I said, "John, you know, it just doesn't feel right, I mean the idea seems really cool but it doesn't feel right, I don't quite know what to say about that." And eventually the wonderful writers of 8 Simple Rules sat down, and reconsidered it and the episode that came out was that his children on the show ended up playing our characters, as he like falls asleep and has a dream and here are his children playing the Three's Company people and it was such a wonderful episode, and the writers were so terrific when they saw both John and I were a little hesitant about the material they had suggested, they went back to the drawing board and came up with a WONDERFUL, wonderful episode, so that was really cool and we were you know in fact talking about, 'what else, how else can we bring you in?' Am I going to be like your sister that comes to visit or whatever but unfortunately time ran out and we didn't get to do it, but we were definitely you know talking about it, but the original episode that I would have been in turned out to be so much better that I wasn't in it because it was such a wonderful--the kids, the young co-stars on the show, they played the characters so well, so it turned out quite beautifully. SitcomsOnline: You have done a number of theater work in your career from the '70s to today from plays in Canada to Broadway, what is it about theater that draws you? How long do you plan on doing this wonderful and funny play (Miss Abigail's Guide to Dating, Mating & Marriage) here in New York? We all know "real actors" come from a theater background, and you certainly have that! Joyce DeWitt: Oh honey thanks, well I actually started on stage when I was 13 and I had plan to go to New York and I never even thought about going to Hollywood. I did a summer stock season in Chicago right after I finished my undergraduate (degree). A guest director for that summer season was one of the senior professors at UCLA Department of Theater and he was just relentless the entire summer that I needed to go out to California and I should do the MFA program at UCLA and was like you know the little energizer bunny that never stopped feeling, well he never stopped talking, and so he spengolyed me to go to California instead of going to New York, so I finally relented and said 'I'll go for quarter (because UCLA is in the quarter system, not semester system), OK fine...', you know and life unfolded and within a couple of years there was Three's Company and I had this MFA and life just unfolded. It's kind of like, your life will lead you, if you don't try to figure it out too much and you just kind of follow your heart and that's what happened, I ended up in Hollywood, I was never going there (laughs). And I got very lucky; I got very lucky indeed (laughs). Aw honey, thank you for saying the play is wonderful. It truly is a wonderful piece of writing and it has the same spirit as Three's Company, which is that we're just trying to be silly and fun and make people laugh and every once in a while we might say something that touches your heart or moves you, your into that place of heart-felt human being and I love that sort of material and it is SO well written. I mean Ken Davenport and Sarah Saltzberg they really wrote such a FINE piece of material, so it is a joy ride just to do it. And I'm here until the end of September and the play closes on October 2 and then they're going to do Godspell, so we're here for a while (laughs). SitcomsOnline: How did you come to know about Miss Abigail's Guide to Dating, Mating & Marriage and what made you take this role? It certainly was a good decision, as the play has gotten great reviews and exposure! You even got to ring the closing bell at NASDAQ a few weeks ago! How was that like? Joyce DeWitt: They sought me out. The producers, the director, and writers came looking for me and asked if I would step-in when Eve Plumb was leaving and I flew in and saw it and Eve was wonderful in the role, I really had to think about it, I didn't know if I could hold up what she had done. I guess she was very wonderful in the role and then we had conversations about transitioning the show in terms of how I would play Miss Abigail and eventually we all sort of agreed, 'OK we're going to do a lighter, more playful version,' and so we all jumped in the pool of the deep end together (laughs)! Well that (ringing the closing bell at NASDAQ) was amazing! When they bring someone in to do that, they make a very large event out of it, I mean huge, huge event, different people speaking and it's like wow-fie (laughs), it was like cool and a tiny bit nerve wrecking. I had this wonderful woman that was giving signals off-camera because you have to ring that bell at exactly the right moment for it all to be legal, so it was very exciting and I would've never imagined that I was going to end up at NASDAQ, that was quite surprising (laughs)! I was delighted to be invited and I like stunned that they would even think of me. We had a very wonderful experience that day and really sweet people but it was really large and I was expecting I was going to walk in and ring a bell and leave. But it was an EVENT, so it was very fun, very fun indeed. SitcomsOnline: James Franco did a short film on Three's Company for the Sundance Film Festival earlier this year and Richard Kline went to screen it and loved it. There is talk that Franco could develop a feature film or even a Broadway play on Three's Company. Richard told me he would work with James Franco in a heartbeat. If a film does happen, would you take part in it? It would be a fan's dream come true to see a film, as it doesn't look like a reunion retrospective will ever happen, since we lost John, Don, the Ropers and you know Suzanne being Suzanne. Joyce DeWitt: Yeah a reunion without John you know that is pretty impossible and most of our partners in crime or whatever (laughs) are you know up there entertaining angels now, so that pretty much can't happen. Actually the owner of Three's Company, Don Taffner--DLT Entertainment, Don & Eleanor Taffner, great friends and beautiful human beings, and the most spectacular people you would hope to know, they're the ones who bought the rights from the British series, Man About the House, to create an American television show, and DLT is actually in the process of preparing an off-Broadway play and I read the first draft of it and it is awfully good. So they probably will do the Broadway thing on their own. I was invited to come to Sundance when James' film was screened, but I was doing a play in Toronto so I obviously couldn't fly in for the night. So I haven't seen it but I don't know what he exactly did with that or what his intentions are but he's such a talented, wonderful, young professional that I'm sure if he decided to do something, it would probably be pretty wonderful. But I didn't see him or I don't know him but I do know his work, and as an actor I enjoy his work enormously, I think he's very talented. But I didn't get to see the film so I can't tell you what he did, I can't comment on that. If Richard said he loved it, I'm sure it was excellent. Absolutely. Joyce DeWitt: Actually I took about 15. Oh gosh, no, you know I was very little when I knew that the work in my life would be out of an actor and the first time in my life I stepped away from that intense commitment was after Three's Company. I was going to take 6 months off to kind of decompress (I can't think of the right word), chill and rest but I was drawn quite naturally as my life has unfolded always into the next moment and the next moment was I started traveling the world and studying the great religions of the world and working with different spiritual teachers around the world and that became all-consuming very precious, opportunity, a very sort of spiritual odyssey, an inner-quest, and thanks to Three's Company I had the money in the bank to do be able to do that. When I left it was time to go back out to the world again, my business manager said, "thank you, there is nothing left to sell" (laughs). I was pursing what I in retrospect I call, "The Art of Being Human," you know where not born with an instruction manual and all human beings I think are doing their best to be the best human being they can. But they don't have a guidebook for that, so I was looking and studying and learning about that process and about how you know what is our responsibility one to the other, what is our responsibility to planet Earth, to the universe, to this place that we live in, to our fellow man, if we indeed have one, and if we have one, what is that, until I was looking for an understanding of the bigger picture of an individual life. People have asked me to write a book for so long and in my head I think to myself, 'well if I ever did the title would probably be The Art of Being Human and How the Heck Do We Figure That One Out' (laughs). That's kind of the working title (laughs). But going back to work there were occasions like Living Single, where they would you know call me or call my agent and ask me to come in and do this, so I would sort of go out of my hermitry into Hollywood on occasions, for the most part I would only leave it to and go do theater, because that was my home. But on occasions, like with Living Single, it was pretty extraordinary the day I walked in there, you know she was so amazing, she like got up and bowed down. And I was like, 'Holy God Queen Latifah, are you kidding?' (laughs). And I have watched her career evolved, my goodness...oh my god, so much talent and the beauty of watching her keep moving through each step of her life and sharing with the audience, and evolving herself as a performer, I'm quite a fan. And the day that I walked into rehearsal hall, to start rehearsing that show, the way in which she greeted me, I tell you I definitely started crying, I was like 'oh my god, you even know that Queen Latifah would even know who I was?' (laughs) So it was pretty darn cute...very sweet. And I have had many experiences like that, where there were people that I have admired greatly and I had no idea they'd even know who I was and there it was. They were very unexpected. I was actually on the stage at the Grand Ole Opry one night, not expecting to, I mean I thought they were just inviting me to come. I was doing a play in Nashville and so I went, and it was the night that the Grand Ole Opry that was live and all of a sudden I got out of the car, I went through hallways and they took me in and I ended up backstage, I was like 'oh, my goodness.' And then the amazing Miss Judd comes stepping out of her dressing and the two of us are like face-to-face, and I'm like 'oh my God,' and she's like 'oh my God,' and we're like 'oh my God' (laughs). And if you think about this, that Wynona Judd would even know who I was, hadn't even crossed my mind. I'm the same with Frank Sinatra, I mean Princess Grace, I mean I've had opportunities where I was just like kind of walking along as a walking actor and these amazing people that I respected and admired, their work, how they lived, and what their lives are about, um I was shocked that they were getting to meet me. So I've had a very blessed life, things that you could never expect coming from getting to have great joy of doing a sitcom in the '70s and '80s. Who would have thunk it (laughs)? Anytime an actor is giving an opportunity to do something that creates joy, causes laughter, it's a gift, you are fortunate as an actor to be given that role and if you do something that does that, and then 35 years later it is still doing it, you just kind of go, "Thank you, thank you" (laughs). So very lucky. SitcomsOnline: Finally, I asked Richard Kline this as well, but do you see yourself returning to sitcoms as a series regular or perhaps even doing Dancing with the Stars? We need to see Joyce DeWitt back on our TV screens every week again, whether it is a sitcom or hitting the ballroom! Don't worry that creep dance instructor Michael, from episode 107 ("All That Jazz") of Three's Company, must have long retired so he won't be hitting on Janet again! So you can come and dance on ABC's floor! Joyce DeWitt: Aw Pavan that is so sweet, thank you! You know I'm so happy to be doing my work, and you know I took such a long hiatus and so grateful that opportunities are coming to me indeed, we have looked at any number of series over the last many years, if one is presented and they would invite me to come to it that I felt like I could make a contribution that would be a value to the show and a value to the audience who watch it, I would do it in a heartbeat. For me when I look at a piece of material, one thing that I want to know is, 'what is the gift? What is that we are giving the audience?' When we end the episode and they turn the channel, or when we send them out from the movie theater with their, you know, buttered fingers (laughs), or when we send them out of the theater, what is that we have given to them, what is that we have said from my heart to your heart I send you with it...and sometimes that's just that we all celebrate in joy, and it's a good time and pure entertainment, and sometimes it's that we you know talk about an issue that matters and we want cause each other to think about something, there are all different reasons to be in the theater, to have the opportunity to share in the performance modality with an audience. But for me the first question, and the only question, before I get deeper into can I serve the piece is, 'what's the gift? What are we giving?' And then the next thing I have to know is whether or not the role that I'm being asked to play--and quite often I've said, 'you know what, I should play this role instead. I can serve this play better, if you let me do this.' For most of the time, that has occurred, I've moved over to a supportive role as opposed to the central role because I knew that the piece of the puzzle that I could put in, would support the whole and that I believed in what the whole of the piece was trying to say. You know if you ask people to sit down and be quiet, turn out the lights, and look at the other end of the room where there's lights on, you best have something of value to give to them, I think. Whatever your sense of value is, from my perspective, that's where the choice is made. If I can join this circumstance, it has to be because I know we're going to share something of value that I believe that my heart would want to share with your heart. And I'm happier when that is about joy, and every once in a while a little bit of wisdom slips in there, and every once in a while one's heart gets touched deeply, and that's what this play does here, Miss Abigail does that, we just go out there and make them laugh and laugh and laugh and touch their heart on occasion and that's the same thing Three's Company did. That's my favorite kind of material. I'm a very fortunate actress who is given an opportunity many times to do that, very fortunate actress. Very lucky that's for sure. (As for Dancing with the Stars) Well I'm pretty old (laughs). That's a lot of work. If they would invite me to do it, and I thought I had the stamina, I would jump in. I mean, it's such a spectacular show; it's ridiculous that they would even bother with me. But yes, if I were invited to do it, I would definitely jump in there because music and dance, there such beautiful expressions of the human heart and the human soul and when they're performed for an audience, the audience get to have that experience. So oh, absolutely, it would able a joy and a pleasure (laughs), an unexpected one, I doubt they would come looking for me. But yeah it would be a joy and pleasure...you never know (laughs). 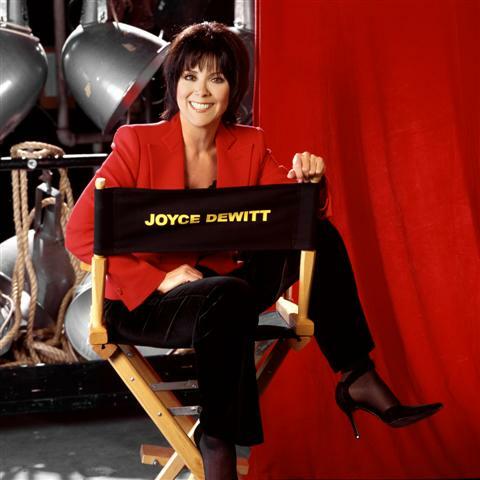 Our sincere thanks to Joyce DeWitt. We are VERY grateful she gave a lot of her time just for us! We wish her continued success on the excellent off-Broadway play Miss Abigail's Guide to Dating, Mating & Marriage. For more information on Joyce DeWitt, continue to stay with us for info and don't forget to view the official website for Miss Abigail's Guide to Dating, Mating & Marriage. And if you're in the NYC area, you can win two free tickets to the show by entering our Facebook contest. Hurry, time is running out! Stay tuned tomorrow for a recap of what I thought of Miss Abigail's Guide to Dating, Mating & Marriage and maybe some more quotes from Joyce! She even gave us more details on how she was worried about doing the improv bits in this new play, as there is a lot of interaction between the audience and the cast, and some other items as well. Anyway, stay tuned right here on the blog for continued news and updates for Joyce and everything Three's Company and Miss Abigail's Guide to Dating, Mating & Marriage! She is truly a wonderful human being, so please go out and watch her play and meet her! SURPRISE OMISSIONS: Community was deserving in this very competitive category. SURPRISE OMISSIONS: Charlie Sheen wasn't nominated this year because he didn't submit his name. SURPRISE OMISSIONS: No Toni Collette, Lea Michele, Courteney Cox or Patricia Heaton. Melissa McCarthy and Martha Plimpton receive their first Emmy nominations. SURPRISE OMISSIONS: No Neil Patrick Harris this year. Nick Offerman from Parks and Recreation could have also been nominated. Ed O'Neill receives his first Emmy nomination. SURPRISE OMISSIONS: Busy Philipps from Cougar Town wasn't nominated. SURPRISE OMISSIONS: True Blood was a surprise last year, but it wasn't nominated this time. The Killing and Justified were left out. SURPRISE OMISSIONS: Some were surprised when Ray Romano from Men of a Certain Age wasn't nominated last year and he was left out again this time. SURPRISE OMISSIONS: Kyra Sedgwick had been nominated for each year of The Closer. SURPRISE OMISSIONS: No real surprises here. SURPRISE OMISSIONS: Surprised to not see Sara Ramirez from Grey's Anatomy or KaDee Strickland from Private Practice. Both were very deserving. View the full list of nominations. The 63rd Annual Primetime Emmy Awards airs LIVE Sunday, September 18 at 8pm ET/5pm PT on Fox.